Gammel og ny Ranger kniv, disse har det lille ekstra. Meget gode Sveitserkniver. To typer for frigjøring av lås, for å kunne lukke bladet inn. I like the old Ranger knife, it is a very interesting design, in 1990 Wenger introduced new knives in a 120mm category. Even knives in collaboration with Buck in the USA with special handle designs. The old Ranger is a good size construction with larger tools, all of them fit into a more professional use. If we look on the difference between the old and new then we see that the evolution Rangers got many changes. First on old – the locking mechanism and slide button operates the liner, and the way it is done with two hooks is just brilliant. Another very smart design is how the liner will lock the blade. Then Wenger designed a new construction and knife, now we see a fully developed 130mm knife designed new a-z. It is a knife with many differences from the old. The push button emblem will release the lock so one can close the blade. It is a safer and more comfortable design. The lock is only to prevent accidental closing like the old. The blade and functions has changed places into a more comfortable placing. The evolution scales on a medium thick knife like the Ranger 55 is very comfortable. Another detail that may be very important is the rivets, they look to be a different material or changed, on the old it is a brass. I got no special info on it. The blade now got a different shape and the edge is better on the new, it is sharper and it bites wood better. The design, as i did mention that the old is a nice knife and fully usable for the more heavy work. When it comes to comfort and design then the new is just top notch. 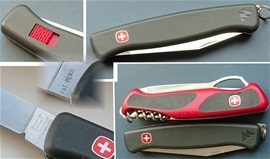 It is not difficult to see that this Swiss Army Knife with the functions is made for the active outdoors. 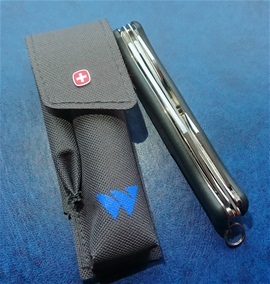 A Swiss Army Knife must perform and I am not wrong when we SAK enthusiasts say “it is an advanced knife”. It is a technology in the hand. 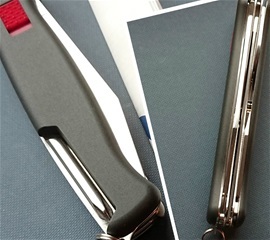 One thing I also did notice – the use of the steel liner for the key ring is a very nice invention on them(on both, placing is better on new). I am sure that Wenger had much to say making these knives but I would love to talk to the main designer. It is something extra done here I would say. Glimrende kniver. Wenger designed the New knives new a-z, and the company got history from 1893, i would love to talk to the main designer at the Wenger Delemont factory. They are really nice knives. both old and new Rangers had the liners and springs side by side without sharp edges. From 1990 Wenger started with the old Rangers and larger tools and handles for more outdoors professional use. Also the old Rangers did use the press fit handles! The construction of the liners and springs side by side got no sharp edges so you can use the thumb without scratching the skin. This is perhaps just a minor detail for most and i do not hurt if a SAK got some sharp edges on a liner. It just show the detail work from Wenger. The new Ranger got a blade that follow the spring and they use jimping for the thumb.Very nice design. I am not sure if any of the old Rangers had a similar design on any time in history? This is my latest Wenger knife and this is the Ranger 01 with one blade. I just bought this in used condition. This is in very nice shape and only required cleaning and sharpening. It is 120mm category. The New Ranger knives are 130mm category you can see it compared on the picture. It should be a mid-1990s knife this Old Ranger. The blade is very polished so i had to do some adjusting with the camera. It is a cool blade. Some time ago i found another Wenger 120 (1 77 06 )also called 06 Mountaineer. 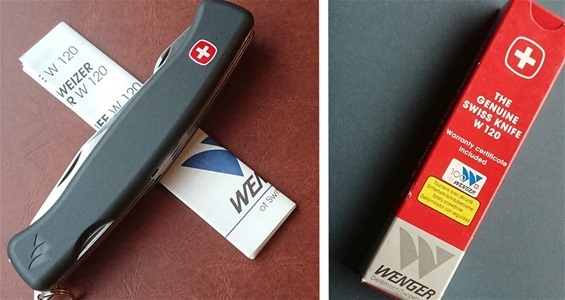 In 1993 Wenger celebrated 100 year anniversary and some knives got the sticker label 1893-1993 Wenger 100 on the box. From before I have the same knife in a box that is also what I consider mint condition. It is important so I can compare the knives and learn some more. I have seen several Old Rangers but it is not often I see them here. It also got the older wood saw with the different cut and design. The Old Ranger knives was introduced around 1990. Two things i can mention about the 120mm old Ranger category and models are the blade centering and locking mechanism. Some got a very tight locking mechanism and the blade centering is rather perfect. Some can have a blade centering that is towards one side but usually always not touching the liners. My latest one got a blade centering that is a bit towards one side. It does not touch the liner and this is original from the factory. I have seen some Old Rangers over the years. They are very nice SAKs. Some can have no play in the lock and some can have more. This is normal. I am impressed with the 1 77 06 models. They are tight and have very good precision. I would not worry if there is some play in the lock or if the blade centering is a bit to one side. It does not affect functionality or the quality. The lock will not fail if there is play either. The New Rangers 130mm from 2007 and 2009 with following models that is todays Victorinox 130mm are all very nice SAKs and tools too. Most of the functions look the same on the Old rangers and Wenger`s New in 2007 and 2009. The difference is the handle ergonomics and design that became thicker and with an added new running change with the evolution and grip designs. The Old Rangers from 1990 are related to the SwissBuck design too. The Old Ranger knives are slimmer in the handle which is something some preferred. The Older Rangers had different steel and was different to sharpen. No problem but I like the new steel that was introduced in 2007-2009 the best. There are a few different information on what Wenger used on the New but anyhow in my opinion it was upgraded and had a better steel. Maybe not on all it could the later ones from 2009-2013 that had the best. 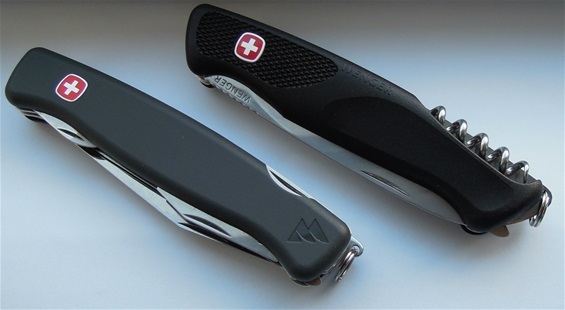 Victorinox may have changed the stainless steel used again. 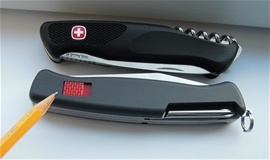 Victorinox always also guarantee that high quality stainless is used. What they changed was the handle design to become slimmer again but still with ergonomics and RangerGrip or evolution type design. Different can-opener and awl plus added handle scale tools. Also a few other things were changed. The 1990 design introduced the larger size functions with locking mechanism for safety in the outdoors. For specific or random crafts work as well. On many Old Ranger 120mm knives the nail-nick from the beginning can have the two types of nail-nick`s for opening the blade. I was wondering if the nail-nick could be used to date them. It actually seems there are two types from the beginning. They are placed at the same spot but one is a bit wider. Probably production variations then I believe. What is a bit surprising to learn about the Old Ranger models is that the ones with several functions like the Mountaineer got the best precision on the locking mechanism. It is operated by a slider that pulls the liner lock to the side. The lock is the same on them but with some variations in play by the models. What I am surprised about is that the models with the most play are the 01 model that only has one large knife blade and no other functions. I learned this from a collector that said the same thing and also what I have experienced. Still it is no problem at all. Maybe it could be from a certain period or production reasons for this. It may be different impressions by others. It is just interesting. The New Ranger knives introduced by the former Wenger Company implemented one hand opening on several models. This and the push button release for the liners + the handle design lifted the Ranger knives to become super well-known and loved by many users and collectors. I can recommend looking for the 2013 labeled models that was the last year by Wenger. There could be other later labels but I have a feeling that the lasts months of 2013 are Ranger models you should not forget as a collector or enthusiast for Wenger. Strange how time goes fast, already soon 2019! Here is my latest Wenger Ranger knife and this is also a model 1 77 06. This one got a pouch for it. This Wenger 120mm still got the wood saw with the different cut that is a bit earlier. I have placed the knife itself to be made in the mid-1990s. I find it interesting to look for variations and production details. The liner locking mechanism on this is 100% tight. It could not have been done better by a custom hand. I have mentioned before around that it is most likely used a few different steel grades for the Ranger 120mm from the beginning until the end of its production. The blade shape, the edge and design is completely the same on this as the last one that also is very very nice. That said I do not believe the steel is completely the same on this because it is much sharper and it is also an original edge that is not done anything with. I can see with a strong magnifier that it is similar. It is most likely an upgrade on the steel used.